The rPOD-8.4 features Pro-audio quality channels (eight independent audio channel outputs plus with four subwoofer and seven-band equalization for each channel). Channels can be group as stereo or mono playback or combinations of both. Audio polyphony (multiple sounds out of one channel). DMX512 Transmitter/Receiver for lighting and character control, Realtime clock, two RS-232 Serial Ports, two Compact Flash Card interfaces, MIDI In/Out/Thru, Optional expansion bus. Optically isolated inputs(12) and outputs(12) included. 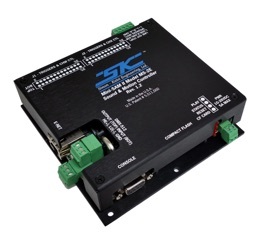 Additional serial interface can be set for RS-232 or RS-485. High or low side triggering. Four audio inputs. Powerful new user-programmable sequence scripting language. The all new Mini-SAM II (Model MS-2E) features 2.1 stereo or 2 independent professional quality audio channels (up to 48.1Khz sampling 16 or 24 bit PCM), with audio polyphony (multiple sounds out of each channel) and DSP functions including seven-band equalization. Eight optically-isolated input triggers, 16 digital outputs, line outputs mic/line in, on-board 25 Watt per channel power amplifier, real-time clock, DMX-512 in/out, Ethernet, and Compact Flash and RS-232 interfaces. Powerful new user-programmable sequence scripting language. 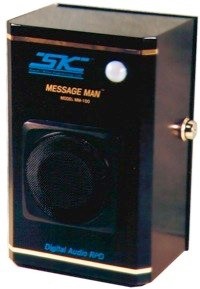 Can be used as a digital doorbell or carillon player for church bells and on the hour messaging. The DMX16-DO receives DMX512 data and converts the data to 16-bits of discrete open-collector control. An on-board hi-speed UART and micro-controller ensure a 250 Kbits/sec. and frame rate set @ 32 frames/sec. 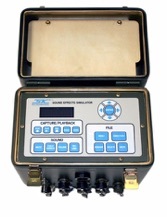 The SES-5 features five independent CD quality audio channels, 16 bit PCM. 256 messages. On-board record/playback capability. Five 10 Watt power amplifiers, VF Display and keyboard. 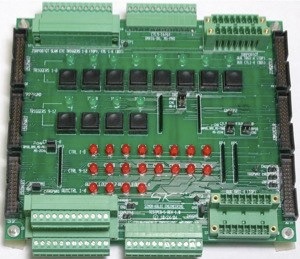 RS-232 interface. Water-resistant package and rugged construction for outdoor use. Microphone and one outdoor waterproof speaker included. 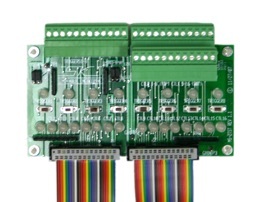 Audio Mic/Line Inputs, Audio Line Outputs, RS-232, and optional RS-485 interfaces. Vacuum Florescent Display (VFD) and keyboard, built-in storage. Microphone and one outdoor waterproof speaker included. Encloses Mini-SAM II into a locking enclosure with integrated speaker and motion sensor. Great for Point-of-Sale and other message repeating applications. Breaks out IDC style connectors to screw terminal Euro-Style removable connectors, 12 trigger switches for manual triggering, 12 trigger status LEDs, 12 control status LEDs. 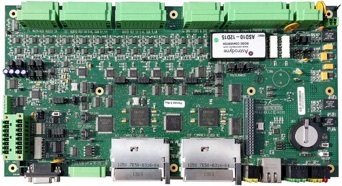 Provides in-line connectivity between Controller and Load with Test Board in the middle. Tests all triggers and controls for MS-2. Provides optional breakout capability. Breaks out IDC style connectors to screw terminal Euro-Style removable connectors. Provides vertical connectivity between MS-2E and load with no additional cabling required. Output: Regulated 24VDC @2.5A for MS-2E, DMX-16DO and other devices. Shown in conductive Chemfilm finish. Also availble in black finish.